thanks, for the command! 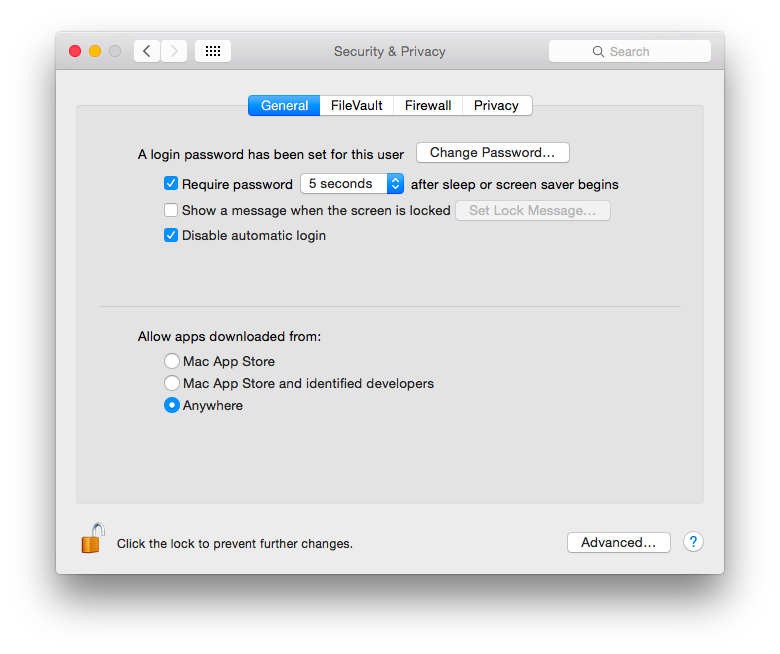 i just installed yosemite, … i can not understand why apple wants to build a ‘stressfull’ habit to the user, re-enabling every time the gatekeeper. Does this mean, even if the computer is in use, running, it would be necessary to use Gatekeeper in some manner every 30 days, or only if the computer is sleeping or off for 30 days? If the former, then what constitutes ‘triggered’ or ‘activated’? Other than going to System Prefs/Security/General and changing the settings once every month, how else would Gatekeeper be ‘activated’ or ‘triggered’? I have not yet tried your deactivation solution. I am awaiting the return of the faulty MacMini (running Yosemite) so I can test three machines side-by-side for one month… one that is continually starting and stopping each day; one that is shut down for a month; and one that has Gatekeeper de-activated as per your instructions above. That’s what I was told by Apple in my bug report and I didn’t have time to get into the nitty gritty. I assume that they meant that if another application requiring approval by Gatekeeper was needed, that is what would reset the rearm countdown. I can’t definitively recall that reusing a previously approved application would reset the countdown anyways. I disabled the whole thing with the defaults override since it’s a useless “feature” and false sense of security to begin with. My specific problem in more detail is this: I have sent a MacMini with Yosemite to a collector, who exhibits one of my works on a screen, via QuickTime 7 Pro. The film is 52 hours long, and plays in a loop. The computer is set to start at 6am and the Automator App which I created, placed in Log In Items, starts the film in Full Screen in QT7 Pro, the script then ‘pauses’ for 19 hours, then has a ‘Watch Me Do’ action that is a succession of keystrokes in Quicktime: Cmd F, to take the film out of full screen; Cmd S to save the position of the timeline; and Cmd Q to quit QT7. There is a last action in the App, an Applescript that tells the computer to shut down. This has worked when I’ve tested the machine in my studio for a full two weeks. I was notified after a month that the App was no longer working. A window appears after the 19 hour pause saying the ‘Watch Me Do’ action can’t be completed, please check the Automator script. The computer shuts down later, via Energy Saver, and restarts the next morning at the appropriate time, but with the film in the original position on the timeline. I cannot determine whether the problem is due to the computer having been turned off for 30 days (from the time it shipped from me in France and was installed at the client’s home) or whether simply the computer, after 30 days of functioning properly, reverts to a default position and stops the App from having permission in Accessibility. I have run tests on another Yosemite MacMini here, and if permission is denied in Privacy/Accessibility (either by removing the App from the window, or unchecking the box), the ‘Watch Me Do’ action is blocked and the App fails. This is regardless of whether in Security/General the computer is set for ‘allow apps downloaded from anywhere’ or ‘from Mac App Store’ only. Any help would be appreciated. Your post is the first reference to something that would appear to explain what is going wrong and how to be sure I can fix it for the future. I’ve removed that confusing line. My understanding is that if Gatekeeper hasn’t been triggered or activated then it will rearm itself in system preferences. I don’t know if the rearm behavior extends to individual applications or Accessibility. You have an interesting case. If the behavior does indeed extend to individual apps and Gatekeeper doesn’t remember previous approvals then it would make sense for a rearm to occur if the computer was powered off for 30 days. Have you changed the defaults value on the system to disable Gatekeeper rearm? I’m interested to see if the problem reoccurs after 30 days.